Price is per 15-inch strand of these beautiful agate beads. Each measures 8mm x 5mm - about 82 beads to the strand. As these are natural, actual colors & pattern will be different to picture. Agate is nature’s most striped gemstone. A variety of microcrystalline quartz that forms in layers and many colours and texture, by filling a cavity in a host rock - although it is usually in round nodules with bands looking like eyes in the rings of a tree trunk. Different colours are caused by iron oxide or limonite crystals carried by water seeping into the cavity. Some people swear that wearing agate heightens spiritual consciousness and balances the body's physical and mental state. Agate was valued as a powerful talisman in ancient times, when it was used on the breastplates of armor to give strength and courage. Agate is also thought to protect from stress and bad dreams, and help stomach upsets. Agate can't change emotions, but improves our level of acceptance. Wear agate when you have to make an important decision. It is also considered to be an excellent stone to heal and improve relationships, and is especially protective for children. Fire agate has a translucent deep reddish-brown base, with flashes of orange, red and green that appears as living flames within the gemstone - prompting alchemists to believe it contained the essence of fire. Its mysterious ‘cracked crystal’ appearance provides a vibrant energy that awakens the lower chakras and stimulates a zest for living. The inner heat enhances sensations and stimulates creativity, sexuality and will. 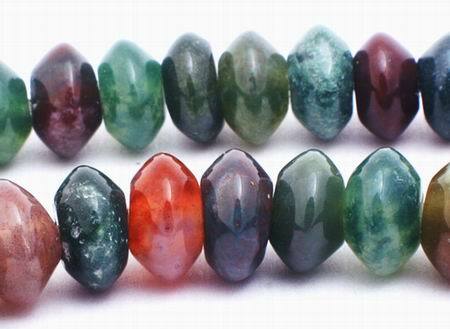 Fire agate is a stone of integrity for the ambitious that increases stamina and circulation, as well as stirring the emotions of others to aid attraction between mates. It is said to liven up the feeling of humdrum routine. Dzi agate beads look very mysterious, originating in ancient India and brought to Tibet over 3,000-years ago. These shiny beads, patterned with round brown dots surrounded by white circles called ‘eyes’, are among the most respected amulets in the world. Dzi in Tibetan means ‘shine and perfection’. They are considered to provide spiritual benefits and attract protecting spirits. Tibetans thought dzis were created by the gods, and their smoothness implies that they were formed at a high altitude – but they are man-made by firing the stone at high temperature and pressure and etching the eyes into the natural agate. Fear of the ‘evil eye’ was thought to protect the dzi bead’s owner. After weathering the colours erode and look faded. Hold a dzi bead on its ends with your fingers and you may feel the flow energy.